Channeling his inner Easy Rider, Serge Storms saddles up for his most epic, lethal, and hilarious road trip ever as he revvs off to find the lost American dream...starting in the Florida Panhandle. Setting a course for the Florida Panhandle, Captain Serge - with Coleman literally riding shotgun - mounts his classic motorcycle and hits the highway in search of the real America: the apple-pie-eating, freedom-swilling moms and pops of Main Street USA. But the America he finds in the rural burgs dotting the neck of the peninsula is a little bit different...and a whole lot weirder than anything Peter Fonda and Dennis Hopper encountered. In a state where criminal politicians are more common than gators, Serge and Coleman discover one particular speed-trap locale so aggressively inept at corruption that investigators are baffled about where to start. Expect nothing less than madness, mayhem, ingenious homicides, and mind-altering pharmaceuticals when Serge and Coleman's path intersects with the Sunshine State's hyper-dysfunctional rusticity. Where's Jack Nicholson when you need him? 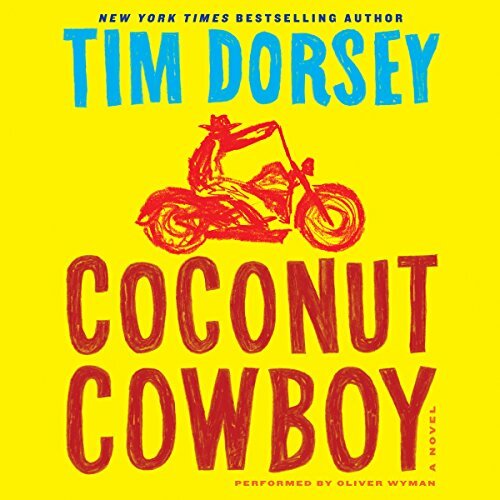 Coconut Cowboy is Tim Dorsey's latest book. With Serge at his best yet. Now I have to wait for the next book. All Tim Dorsey's books are well worth the time. I enjoyed this book in a weird kind of way. Serge and Holman are completely out there and fun, but there story has nothing to do with the developing story. Then toward the end is the unexpected and dubious link. Bottom line: fun characters who live in what should be considered an alternate reality. Read it with a smile and soon forget it - probably. I think Coleman is a distant relative of mine. we need a Surge or two in our country. another crazy adventure with sarge and coleman. as always, the bad guys get an imaginative pay back. Hop on the Crazy Chopper It's Gonna Get Choppy! This story was just crazy enough to hold my attention & keep me guessing what the heck was going to happen next. This is the best example of cause & effect I've heard of; even better than Joe Diffy's! ... I am going to finish the Serge series ... Oh the humanity! Tim Dorsey you da BOMB! What made the experience of listening to Coconut Cowboy the most enjoyable? These books are fantastic! Laugh out loud! Spectacular characters. Fun, intriguing plot with Serge fighting the bad guys. Great thriller, I highly recommend it! Loved it! Couldn't stop listening. Surge and Coleman just keep protecting those in trouble! Love the story. It was well thought out with twists and plenty of laugh out loud moments.